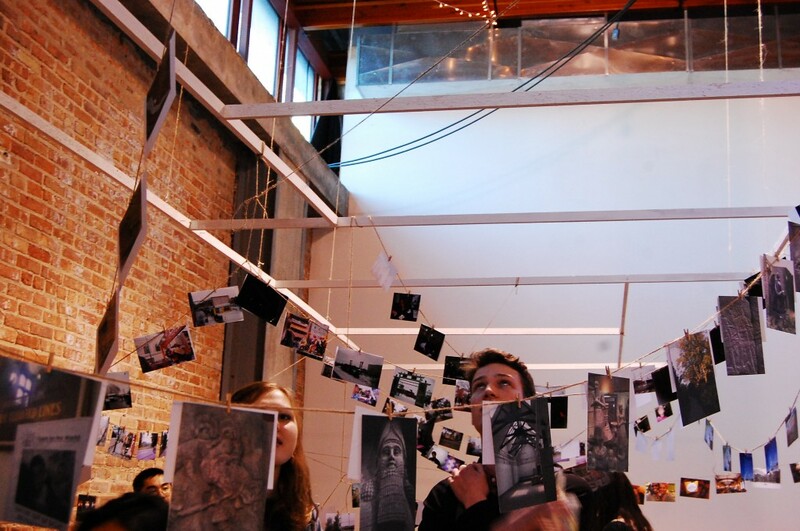 A maze of thin twine ropes, covered in clothespins and 5×7 inch photos, hung from the Experimental Station’s lofty ceiling against a backdrop of twinkle lights and brick walls. The crisscrossing lines of photos, which the college student audience carefully ducked and bent underneath, free bubble teas in hand, were part of the opening night of “South Side in Focus,” an art and community engagement event planned by University of Chicago students and funded by the school’s Uncommon Fund. The goal, according to student organizer Jennifer Qin, was to let South Side residents “tell their stories the way they want to hear them,” and create a place for interactions between the UofC and wider South Side communities. The exhibit was physically set up for it, with attendees bumping and dodging below the hanging photos. Most of the images in the exhibit were captured in the twenty-four exposures of disposable cameras that organizers Qin, Zelda Mayer, and Kris Rosenthal distributed to twenty-seven participants from six community organizations. However, the three let participants use their own digital cameras or phones if they preferred. Some, like those from local youth program Imagine Englewood If, submitted only the film roll; others, like some UofC photographers, submitted up to seventy-five pictures from their iPhones. For all the planning of interactions, though, the organizers hinted with some nervousness that the Englewood student photographers from IEI were going to be late—after most of the original wave of attendees left. At Friday’s opening the chattering of the backpacked students echoed off the walls in competition with the smooth voice of singer Fanta Celah, a collaborator with Chicago jazz musician Phil Cohran. As I wandered through, I saw pictures of an Englewood prom, a series of daily covers from the Chicago Sun-Times, people’s front porches, and a noticeably different set of pictures from the UofC campus. One community organizer, from the Chinese American Museum of Chicago, similarly noted that much of the population in Chinatown is first generation and speaks Cantonese; many of the elderly in their neighborhood don’t speak English, and have no need to leave. Towards the end of the night, the group of about fifteen IEI teenage participants rolled in. They huddled together in the corner, emerging only to excitedly count how many of their photos were hanging prominently. The evening ended, after closing hours, with the group of IEI students playing a song and dancing together in the middle of the exhibit. Mayer asked to join them, and one girl patiently started to teach her the footwork. I looked around, hoping others would join in on what was the most organic and fun interaction of the night. The only other people left were Carter-Hill, the organizers, and me. Zelda Mayer has worked as an assistant layout editor for the Weekly.